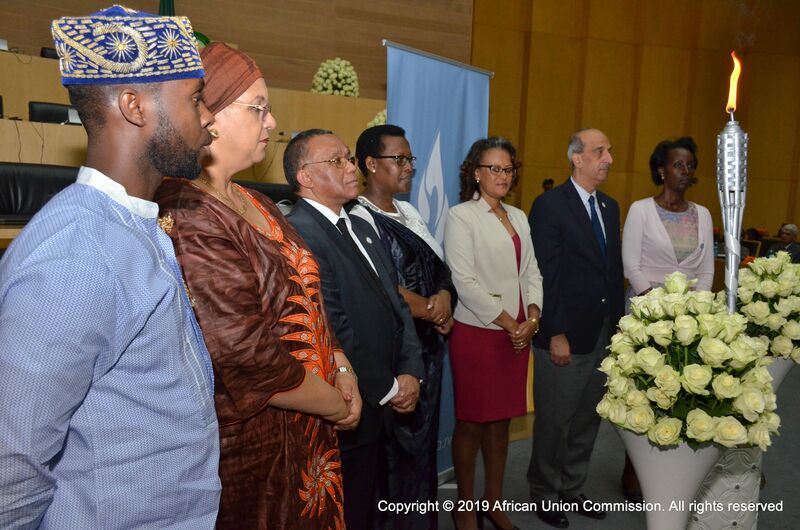 Addis Ababa, April, 07 2019: The African Union Commission’s Department of Political Affairs in close collaboration with the Embassy of the Republic of Rwanda in Addis Ababa, Ethiopia, commemorated today the 25th Anniversary of the Genocide against the Tutsi in Rwanda under the theme “Remember-Unite-Renew”. The commemoration of the Genocide against the Tutsi in Rwanda is annually organised by the African Union Commission following the decision of the African Union Policy Organs to recognise the 7th of April as a day of remembrance of the victims of the genocide and to reaffirmation Africa’s resolve to prevent and fight genocide on the Continent. The decision was recommended by the African Union Permanent Representatives Committee (PRC) during its special session on the Commemoration of the 10th Anniversary of the Genocide against the Tutsi in Rwanda, and later was adopted by the AU Policy Organs. It is now the eleventh year since the African Union Commission started the annual commemoration of the 1994 Genocide against the Tutsi in Rwanda. H.E. Prof. Victor Harison, Commissioner for Economic Affairs, addressed the event on behalf of the AUC Chairperson, H.E. Mr. Moussa Faki Mahamat. He stated that as Africans remember the victims of the Genocide and continue to strengthen their resolve to combat the Genocide ideology and denial, it is vital to keep in mind that the 7th of April stirs within us our appreciation for the gift of life as well as our common humanity which obliges us to renew our collective commitment to uphold the promotion and protection of human and peoples’ rights. H.E. Prof. Victor Harison further underlined that the event is an opportunity to celebrate the remarkable resilience of the people of Rwanda as well as the extraordinary leadership of H.E. Paul Kagame, President of the Republic of Rwanda. He further commended the amazing efforts of the people of Rwanda on the road to reconciliation, creativity, justice, social cohesion, construction management of diversity and inclusive socio-economic development. The commemoration ceremony was addressed by the Ambassador of the Arab Republic of Egypt, H.E. Ambassador Osama Mahmoud Abdelkhalek, in his capacity as the Chairperson of the Permanent Representatives Committee (PRC) . In his brief remarks, Amb. Abdelkhalek stated that “the painful shadow of the genocide against the Tutsi in Rwanda still looms above all of us and remains irreversible scare in the consciousness of humanity as one of its darkest moments in history. That Genocide against the Tutsi in Rwanda had a profound impact on the AU and the African continent as a whole. It lined the distinct boundaries between non-interference and non-indifference and this was deeply rooted at the AU Constitutive Act and AU Peace and Security Protocols” the Ambassador further added that it also gathered the international community around the fair goal and the principle of never again. He further emphasized the need to recognize collective continental and regional responses since the 1994 Genocide against Tutsi in Rwanda. He underscored the need for robust and adaptable programmes for accountability, truth, justice based on national ownership to make never again a concrete reality and healing the affected nations. Addressing the participants, H.E. Amb. Hope Tumukunde Gasatura, Ambassador of the Republic of Rwanda to the Federal Democratic Republic of Ethiopia (FDRE) and Permanent Representative to the AU applauded the AUC’s Department of Political Affairs, schools and academic institution and distinguished participants for their continuous support and solidarity to the people of Rwanda. She expressed the solidarity shown by African Heads of State and Government to join the Rwandan Government and Rwandan people to commemorate the day. H.E. Amb. Gasatura reiterated that today marked the commencement of a period of mourning in Rwanda for 100 days. 7th April, is also the African Union Day of Commemoration of 1994 Genocide against Tutsi in Rwanda as well as the international day of reflection on the same subject, as declared by UN. H.E Amb. Gasatura concluded by underling that fighting genocide ideology remains a duty to all Africans. The event was moderated by Amb. Salah S. Hammad, Human Rights Expert, Political Affairs Department. The event featured among others the AU Anthem, National Anthem of the FDRE, National Anthem of the Republic of Rwanda performed by the AU Choir. A Flame of Remembrance lit by the H.E. Victor Harison, Commissioner for Economic Affairs, a 10 minutes documentary movie on the Rwanda genocide. A minute of silence was also observed in memory of the victims of the Rwanda Genocide. The event was attended by Commissioners of the African Union Commission, Members of the Permanent Representatives (PRC), Members of the Diplomatic and Consular Corps, Representatives of ECA, UN Agencies, International and Regional Organizations, Religious Leaders, Distinguished Members of the Rwandan Community, Students from Addis Ababa universities and schools and staff of the African Union Commission.